One of the benefits of being laid up ill for so long a few months ago was that I had a lot of "couch time", in which I browsed through a LOT of great books. 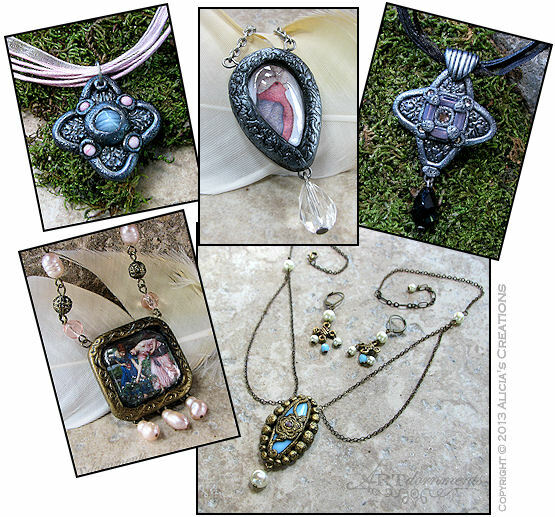 One in particular that inspired me featured historical jewelry, so it's no surprise that some of my newest pieces have a bit of that "flavor"! Galah lovers will need to check out the Rose Breasted Cockatoo necklace! There is also a beautiful beaded necklace and earring set featuring another Waterhouse painting that I love. The three other new necklaces do not feature images, but instead are sculpted around glass stones, some with Swarovski crystals embedded. The necklaces are all being auctioned on eBay for five days, ending on Wednesday, May 22st. I have two new ARTdornments necklaces for you this month! 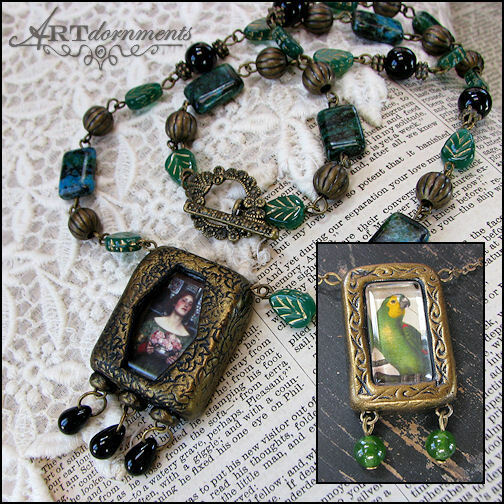 There is a sweet Amazon Parrot pendant on gold chain, and a beautiful beaded necklace and earring set featuring one of pre-raphaelite painter John William Waterhouse's lovely ladies, holding roses. The necklaces both have a Buy It Now option, and are being auctioned on eBay for five days, ending on May 1st.